I love checking out new music. it’s even better when I like it, makes it all the more worthwhile. 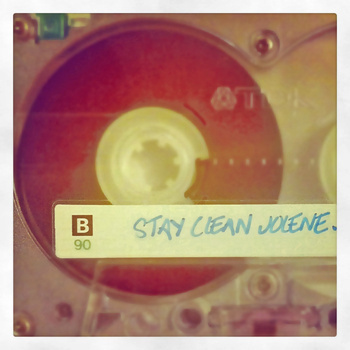 I knew nothing about Stay Clean Jolene before I got this 7″. It is on the excellent Just Say No To Government Music label, split release with 3 other labels. There’s very little info on the sleeve so after 5 seconds I was ready for the needle to hit the record. It made me sit down. It made me write this. I want you to hear them. I wanted to find out more and now it all makes sense. Here is a question. Answer (a) or (b). If your answer was (a) or (b) this could be an interesting film for you. It touches on the thorny question of what is ‘real’ in pop music. It also shows how the music industry works, how to get a record deal, how to get a powerful established manager, how to create a buzz, how to get key tours like opening for D12 on tour (the dream of so many hip-hip acts). As a bonus it shows how you can do all of these things by pretending to be someone you are not. 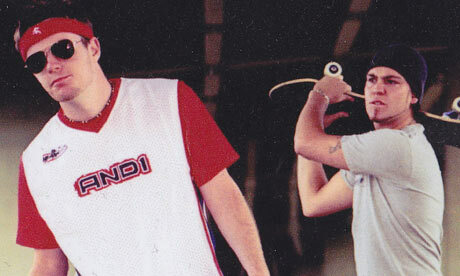 It begins in Scotland with a couple of fairly talented, industrious young hip-hop lovers. They want to perform and get a chance to be heard. Off they go on the bus to London for a record company audition. They do they best, they perform well and what happens? The panel of experts laughs in their faces and basically tells them they are a joke. Why? Because they are from Scotland. The message is: this music is American, that’s why it works. I suppose we have become so accustomed to hearing hip-hip with an American accent that anything else sounds odd. Anyway, the two lads return home devastated. Then they have an idea. If you have to be from America to make it in to the music work…let’s be from America. This begs the question…where in America…why yes, California. So the lads, with perfectly acceptable hip-hop names Silibil (get it? Silly Billy and part of a word!) and Brains become ‘from California’. They work on their accents, they sort of work on a back story and off they go. This is confusing to family members, loved ones etc as they ‘stay in character’ and keep the accents up. Their characters are a bit Wayne’s World, a bit Eminem, a bit So Cal skate-punk, a bit Kid Rock, and more than a bit believable. Things go horribly right and horribly wrong for the two lads. They convince the power-brokers in the industry, get the attention they want, and endure a nightmare. When SONY America come to see them perform in England the label wants to sign them. Unfortunately, the SONY people seem to be more familiar with the place in California the lads are ‘from’ than they are themselves! So they invent a very unusual reason for telling their manager why they don’t want to sign with SONY America! The film is very very funny in places yet ultimately tragic. British Comedian Stewart Lee has discovered his Irish roots; apparently (one has to have a disclaimer as comedians make things up for laughs) his great great great grandparents, the Hurleys, left Leitrim in 1846. Lee said he planned to do a bit more research on the matter, which was of great importance to him. ‘It seems a lot of people left that year’ he added, deadpan, the crowd laughing before an unexpected hush stilled the room; ‘there must have been a good travel offer or something’. Comedy is an intensely personal experience and the main yardstick is the ratio of laughter to jokes. Lee is a hard working, sensitive father of two with his roots in punk rock and the Thatcher era. He tells stories rather than jokes, long, winding narratives which spin off in bizarre directions only to return safely to base somewhere near the end of the show; Lee was warming up new material for a BBC TV series in front of 300 devotees enjoying a rare intimate evening with a performer whose profile is rising as fast as the new Pearl Jam album, which entered the Irish charts at number one this week. Lee got into a taxi and the driver said to him; “these days, if you say you’re English, you’ll be thrown in jail.” It’s the sort of absurd statement that boils the blood and can either be ignored completely or disarmed with a similarly absurd response. If you say you’re english, continued Lee, quoting the taxi driver, ‘you’ll be thrown in jail.” Really? “These days, you’ll be thrown in jail etc..” the riff continued forever, with no apparent purpose other than embedding the phrase deep inside our skulls. The taxi driver was ired because he (apparently) filled out his passport form, crossing out ‘british’ and scrawling in his own hand, ‘there’s no black in the union jack’. The ‘victim’ of this injustice was outraged. No one was thrown in jail, of course, the form was merely rejected and returned. But as we all know, (check Lee’s related sketch on You Tube if you don’t) Political Correctness has gone too far. About three hours later, after a number of digressions and (apparent) breakdowns, Lee described how his daughter’s school celebrated diversity; pantheistic pancake day, Chinese new year, etc. But they also marked St George’s day and for that occasion they invited children to wear traditional English dress. From the moment Lee took the stage it was laughter all the way. Better yet, laughter which didn’t rely on cheap shots (sexism, homophobia etc) or treat the audience as if we were lobotomised morons anxious to gloat over the misfortunes of people with troubled lives for reasons beyond their control. 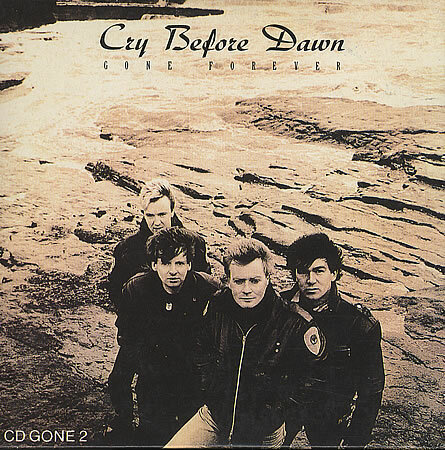 I have always really respected Cry Before Dawn. I first came across them when Mick McCaughan brought them to Trinity when he was Ents Officer. He had a real knack for spotting and supporting talent. And a great big heart that felt everyone should get a chance to listen to music they liked. And if they had talent they should get a chance to be heard. It was through Mick that I first heard the Pleasure Cell and that proved to be a life-changing experience. Mick also brought the Pogues to Dublin for their first head-lining tour of Ireland. And he gave a young singer called Sinead O’Connor a chance to play for some visiting record label folks…and the rest is history as they say. He also brought Five Go Down To The Sea as well as Serious Drinking to the college! He liked Cry Before Dawn so much, he brought them back to Dublin for his end of year Trinity Ball. I even headed down to Wexford to see them play in their home town once and the guitarist’s parents very generously invited me and my record-selling friend Timmy to stay with them. So here I was again watching Cry Before Dawn in Dublin. The last time I had seen them here was at the Cathedral Club. It was a memorable gig and the performances of ‘Girl in the Grotto’ and ‘Black is the Colour’ have stayed in my mind ever since. The band made a statement of how highly they regard the new single ‘Is This What You Waited For’ by playing it first. It was a fine move; the song works ever better live that on recording. The guitar playing of Steve Belton really brought the song to a new level in the Button Factory and the audience received it with gusto. The band always benefited from an ideal rhythm section, Vinnie Doyle on bass and Pat Hayes on drums. They never had to be showy; they were solid in the very best way and gave the songs the best foundation possible. Next up was the band’s early single for Epic/CBS, ‘The Seed That’s Been Sown’, the haunting song of decisions to leave small cities and town. It was a monumental statement for a pop band at the time. It still is today. Singer Brendan Wade is blessed with the kind of voice that makes for folk singers of the highest standard. And that adds strength to the songs that auto-tuning and special effects just never compensate for. Another great early song, ‘Sentimental’ follows, then ‘Yesterday’s Girl’ from the second album which rocked harder than the debut yet lacked some of the intimacy of that first one. Curiously, Cry Before Dawn were a band that seemed at once more friendly and wiser than their contemporaries. The songs indicated a world view and wish for a better world. The conveyed a sense of a search for justice. If, as Brendan announced tonight, some of the songs were from “more innocent times”, those songs also asked very pertinent questions of those apparently innocent times. ‘White Strand’ was next, and it demonstrated one of the distinctive features of the band. 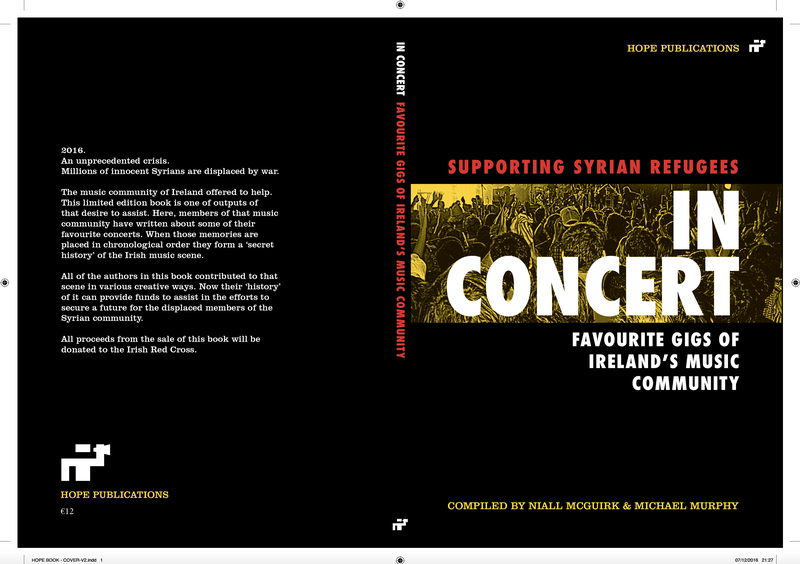 This was their ability to combine elements of rock music with traditional Irish music. And I don’t mean some kind of soul-less fusion. The elements were never forced. They were deftly merged by the Wexford musicians. The tin whistle tonight was certainly evocative of the Wexford home which many of the songs were about. There were a few white strands in the audience tonight, too. Most of them sported by lads in the audience which seemed to be aged between late thirties to early fifties. Most were probably teenagers when the band released their early material. And here they were celebrating great music. And like the band, who laughed that only bands like the Dubliners and the Wolfe Tones were supposed to have 30th Anniversaries, we all had a great night. Other highlights were hearing about pre-Cry Before Dawn musical collaborations at the Sloghadh festival and how the band got the boat from Rosslare to sign their record deal. Nice to hear of young people leaving Ireland in the 80s for something so positive and full of promise. And if Cry Before dawn never did sell hundreds of thousands of records, they never betrayed or compromised that early promise. And that is an achievement in itself. ‘Flags’ was one of my favourite of their songs and it sounded great tonight. I left the venue with the sights and sounds of the entire crowd singing the debut single ‘Gone Forever’. In this case, and not to sound cheesy, this is one band I am glad have not gone forever! I was in London this week at a conference . Thankfully I managed to get to Camden before All Ages Records closed for the night. Whilst in Camden I visited Cookies and Scream and another amazing new vegan cafe Cakes n treats. 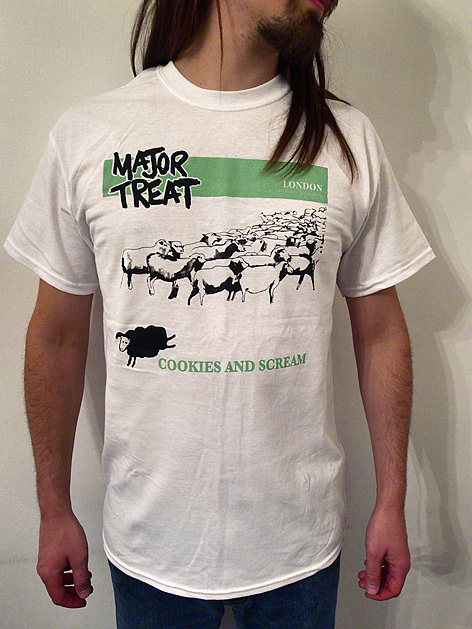 Cookies and cream have a great t-shirt based on Minor threats Out Of Step lp cover. Ironic with all the fuss about Urban Outfitters and all that at the moment. Minor Threat becomes a major treat with some great vegan goodies. I’m playing this song in honour of Camden and all its great eateries. In the interest of balance I’m playing a Lawrence Arms song about drinking and Kevin Costner and Chicago. I’ve moved closer and less punk as I’m wearing my flies on you t-shirt doing this show(it’s all about the balance). I love flies on you sound and they’ve done a really neat thing – their new record is a 10 different versions of josephine to accompany their new videos. It’s all in the mix. Mixing it all up we are delving into the pop mix of the Fall . Blasting out these tunes since before I started buying records it is heartening to know the fall still exist. So many releases, such a legacy. The membranes have their own legacy too, one which will be well remembered. John Robb had to write his own book Death To Trad Rock to celebrate the era they championed. Get it and enjoy the journey. I used to really enjoy New Model Army gigs. Family affairs, much like the membranes. They were a harder family to be part of, but no less loyal. Unbelievably they have a new album out now, 30 years on. These are from that record. Hooligan are from Dublin and I’m pretty sure Dave from that band was at New Model Army’s gig in the TV Club back in the mid 80’s. If he wasn’t he would have been in heart. It’s a night for the experienced musicians tonight. That experience continues with Jon Langford in his more recent guise as a solo musician. Jon was in the mekons and three johns (or maybe that should be he still is, never know when a good gig will come your way). Jon moved to Chicago many moons ago and has continued with his country tinged sound of the mekons but with punk attitude. Torche were over here in August and played an interesting gig. I played them a bit around that time and have ignore them since. To my peril. I picked up the Office OF Future Plans lp in All Ages this week. I have been meaning to get it for a while now but postage has been my enemy in recent years. It costs quite a bit to receive something fromt he States, to the detriment of my record collection. I wish I hadn’t waited so long, it’s a great album. Niall Hope played the Undertones last week on his excellent show. That got me thinking about the great band from up north. They are probably in my top ten favourite acts from Ireland. A pop band who made such great and buoyant music. The only band from Terry Hooley’s fantastic (in every sense of the word) Good Vibrations label to go on to major success. They played the sadly infamous UCD gig where a young man was stabbed to death. Naturally, being young, crossing the border, and playing music made them suspects. The local police force visited their parent’s home following the incident. 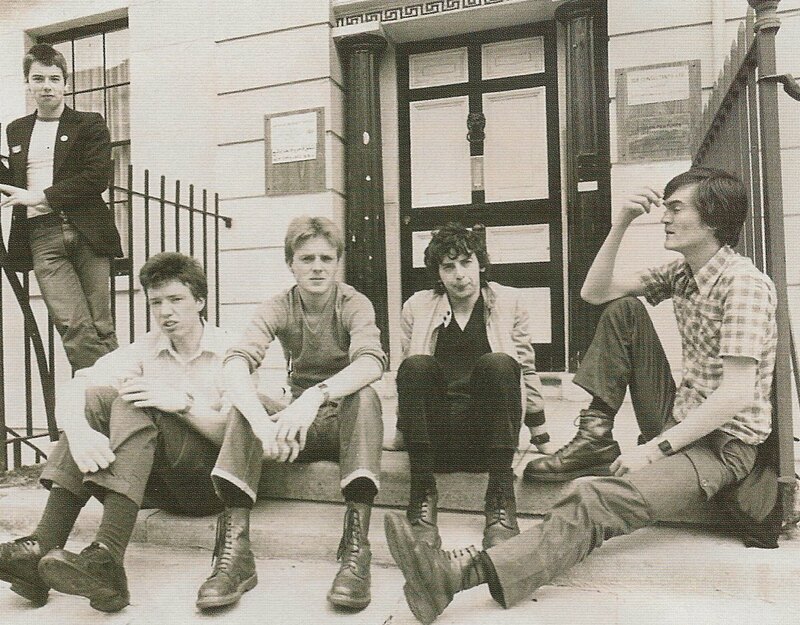 From what I know they were brought down to Dublin by the Radiators, who did some great work in opening doors for other young bands. The Clash later took them under their wing, and brought them on tour in North America. I seem to remember an interview they did with a Dublin fanzine where they were very unhelpful and even made up fake names for themselves. And still they made buoyant pop. Along with the Buzzcocks they made the most tuneful, exuberant, hummable, energetic, feel-good songs of that first era. Recently I have started reading old music magazines. It is one of my favourite things to do. It is fascinating to see what bands said at the time, and obviously to reflect on the words of youth in hindsight. And sadly in some, the Undertones come across decidedly glum. their heart and never thinking they were above you and me. flag will continue flying in our communities for years to come. I was at a great performance during the week by Dan LE Sac vs Scroobius Pip. They did Magician’s Assistant and the power coming from stage was equal to any noise Neurosis could bellow out. Intense and amazing. Crumb up next. I love this band, I wish they were still around. 5 years on I find it hard to listen to them. 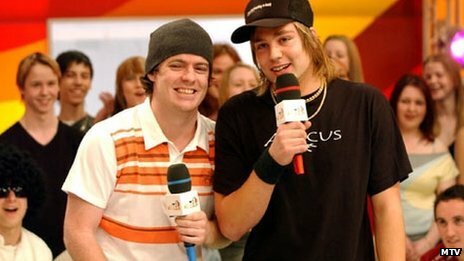 I really wish they were still together. I was reminded on McCarthy during the week by reading tweets from Comedy playwright (is that his proper title) Graham Linehan. My first foray into radio shows was in Capital Radio when I used to give Tony Gahan some records to play on his 20th centruy Promised Lnd show. When Tony decided enough was enough there was a vacancy at the station, filled for two weeks by myself and the aforementioned wild hearted outised but then this Hot Press journalist stepped in. Graham Linehan and his love of McCarthy!! If I didn’t play SE Rogie on my two week stint, I should have. I menat to but I think we wwent for Dead Kennedys instead. What were we thinking? I love the attitude of this bike is a pipe bomb, Most plan-it-x stuff actually. Front Seat Solidarity is a refreshing album which trains and cops is taken from. Against Me go down as one of the best bands I’ve seen live. I’d say top three of gigs I haven’t been involved in. We could have taken over the world that night. What happened? ?